I am somewhat new to Lua, but definitely not to programming in general, so I am just trying to figure out the Lua niches. There were a lot of 'setup' methods, and I was unsure which was the correct. I have been focusing on getting to 50 at the moment, quite close in game, from there I will work on a second revision to this plugin, but I would greatly appreciate people testing the current version, so that if there are any errors or bugs I can adjust it in the next iteration! On the next version I intend to submit it to Curse as well, so it will be easier to install. wrorong post, but anyway this profile needs to be revamped a ton, I will do a version 1.1 soon. From what I've seen, you mostly consider RP to be in plots. From my point of view, this sort of tool is actually a great way to make Open World RP more frequent. For the sake of immersion, I'd say change the title of the location column to simply "Location" which would be the Open world zone or the name of the plot, and have a hidden field for the name of the owner of the plot which would be used for the "Got to Event" button. I just wanted to add my feelings to it, because I really think this could be an incredibly helpful tool for RP! I'm going to look into the code later, and see if I can help in any way. I like that style change. 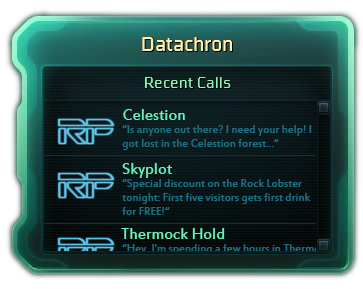 It is most likely possible to reuse the Datachron interface. I was trying to keep it very close to how the FFXIV PF looks since I am the most familiar with it, but I think that looks better. I will take it into consideration for the next version, thank you for the feedback.